Tick season is fully upon us, and it’s not just people living in the woody areas of the country that should take precautions against these blood-sucking creatures. Sure, they love the woods, they love dogs, and they love tall grass, but they are also learning to love city life. Knowing how to prevent, recognize and treat tick bites is pertinent information, and not just for those that live in the country. Tick season, for the most part, is between April and September. While it is a good idea to be cautious of ticks all year round, in many parts of the United States, extra precaution should be taken in the warmest months when these small arachnid insects are most active. Lyme disease was first described in 1977 as “Lyme arthritis,” and is now the most commonly critter-transmitted disease in North America. Each year, over 30,000 new cases are reported, many in areas where no previous infections have been recorded before. Lyme disease is on the move, slowly pressing towards more populated regions. For this reason, city dwellers should not consider themselves safe from the threat of these pesky critters. Why bother, you may ask, to worry about a teeny, tiny little tick? Well, the stakes for ignoring these small but highly dangerous insects can be huge. Lyme disease is caused by the bacterium Borrelia brugdorferi, which is carried by deer ticks or black-legged ticks. Deer and white-footed mice often serve as reservoirs for this bacteria. It is the small ticks that matter most: the juvenile ticks, which are only slightly bigger than a period at the end of a sentence, are the most dangerous. Early diagnosis and treatment of Lyme disease is essential to avoid complications that can last a remarkably long time. One of the big problems with diagnosis is training medical professionals to recognize the rash caused by the disease. Most people think that the rash must have a bulls-eye appearance to indicate the disease, but this is not true. The rash actually resembles such things as dermatitis, spider bites, lupus or other common skin conditions, which makes it extremely difficult to spot. According to an ongoing study that investigates diagnosis of Lyme disease, most prominent textbooks and websites feature a bulls-eye image rash pattern. This has become sort of the hallmark symptom of the disease. This misinformation could lead to a misdiagnosis and lack of treatment. Even more disturbing is the fact that not everyone with Lyme disease actually develops a rash. Other signs of Lyme disease include flu-like symptoms such as fatigue, low grade fever and joint pain. If you feel that you may have been bitten by a tick and contracted Lyme disease, you can ask your physician for a lab test to identify antibodies. These tests are only reliable about three weeks after an infection. Symptoms of Lyme disease that may not appear until weeks, months or even years later include arthritis, numbness and pain and irregular heart rhythm. Early diagnosis can prevent long-term complications that do not always respond favorably to antibiotics, however this is not guaranteed and carries its own risks. Some people can develop chronic Lyme disease which can interfere with their quality of life. Changing thoughts on alternative health and an increase in the acceptance and understanding of the benefits of medical marijuana are paving the path for this “weed” to be used for a number of debilitating medical conditions, many that do not respond well to conventional treatments. With more and more states starting to legalize medicinal marijuana, the pressure is greater than ever on our federal government to remove the unlawful stamp they have placed on it. If medicinal marijuana was made legal by federal US law, it could become a part of the healthcare system, and made available to all individuals who have need for it. There is growing evidence demonstrating that this long-demonized plant can do a world of good for a number of medical conditions. Persons diagnosed with Lyme disease can use marijuana one of two ways. 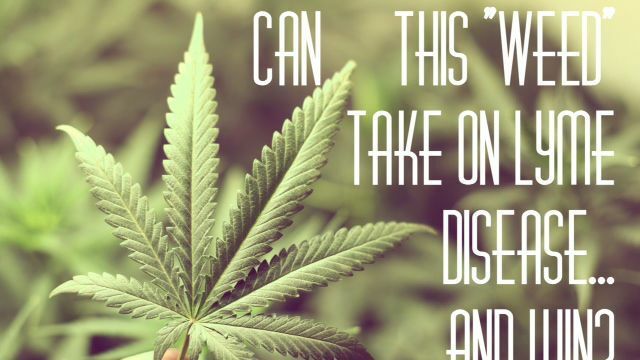 They can smoke it to reduce symptoms, or use cannabis oil to combat the condition. Rick Simpson, the man who pioneered cannabis oil, states that much of the healing qualities of the plant are lost in the smoke. As we reported in an earlier article, cooking cannabis or smoking it reduces up to 99 percent of its benefits.Advocates of cannabis oil state that it is not only an effective way to manage symptoms of Lyme disease, but can also help the body heal. Cannabis oil is an extremely concentrated substance that is extracted and reduced from a very high amount of cannabis into a substance with a good balance of THC and cannabinoids. It is always easier to understand the benefits of anything when you have a real life example. Alexis was diagnosed with late-stage Lyme disease and was initially given antibiotics to manage the painful symptoms. She took these antibiotics long enough to sustain damage to her gastrointestinal tract, and was hospitalized with hemorrhagic colitis. Doctors took Alexis off of the antibiotics and put her on pain medicine that did not touch her discomfort, so she started smoking marijuana. This took away most of her nausea, allowed her to eat again and helped manage her pain and her moods. According to Alexis, she needed morphine and lorazepam intravenously to do the same thing that two grams of cannabis does. Now, Alexis is looking at cannabis oil as a possible long-term solution to her Lyme disease. Shelly’s Lyme disease caused her to have up to ten seizures a day for well over a year. She started smoking marijuana and switched to a vaporizer and her seizures stopped completely. After this, she heard about cannabis oil and decided to give it a try. She was using the oil for a month and was able to return to both work and school. She was also able to enjoy a social life and live on her own without the need of a caretaker. Her hope is that the cannabis oil will completely cure her of the Lyme disease so she can live without fear of the symptoms coming back. The radio show High Noon interviewed Pamela, who suffered from Lyme disease. Pamela, like Alexis, had a very difficult time with pharmaceuticals and started to vaporize cannabis instead, later switching to cannabis oil. She found that the oil completely removed all of her symptoms, and she was soon no longer bed ridden. After a short time, she ran out of the oil and the symptoms came back, confirming for her that it worked. Note: There are no real studies confirming the use of cannabis oil for Lyme disease, many people just find that they are experimenting with what works best for them. As we reported in an earlier article, Coconut Oil and Cannabis Capsule – A Medical Miracle, the oil is being used with success to also treat cancer. While many remain suspicious of the therapeutic benefits of cannabis, those that have had a positive experience with Lyme, cancer or any number of other conditions continue to speak out about their experiences with the hope that they can educate and inform others. 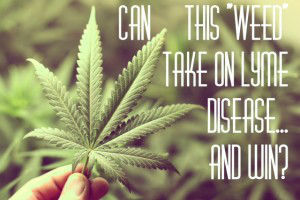 Hey Buddy!, I found this information for you: "The “Weed” that Could End Lyme Disease for Good". Here is the website link: https://www.thealternativedaily.com/weed-end-lyme-disease-good/. Thank you.